We need your help because we want to take our gloves off for 2019! No matter who we elect, the same thing keeps happening at America's wide open borders and illegal immigration has just reached a new historic high! 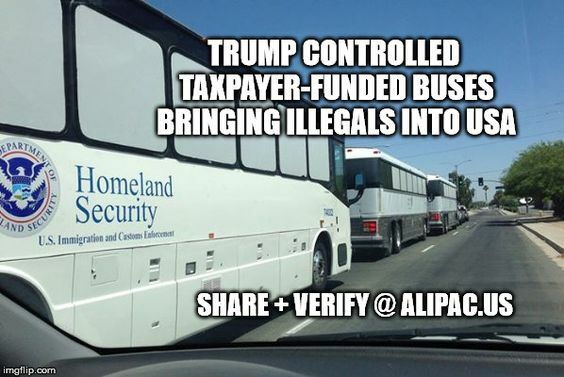 The fact our own government is encouraging and facilitating the invasion by busing in fake asylum seeker illegals at US taxpayer expense (View Videos) is intolerable and must be stopped. Theses videos show Trump's DHS buses importing 90% male fighting age illegals of which more than 90% will not qualify for asylum if they ever show up in court. Less than 10% ever show up for court. The DHS/ICE buses you see in these videos are under the control of the Executive Branch which is under the control of President Donald J Trump, not Democrats or left-wing judges. This is your government busing in illegals through the catch and release program Trump said he ordered an end to nine months ago (View Video Proof). Catch and release is not a law and is not required of the President. It is a Presidential policy. That is why Trump said he ended it via memo 9 months ago. That is why we are asking for both your support and understanding as we strive to take our operations, tactics, and messaging from ALIPAC to a whole new level. As you may have heard in our latest interview, we are ready to rumble and really take those betraying us in DC to task in 2019! Last edited by ALIPAC; 01-06-2019 at 06:13 PM. MW, stoptheinvaders and JohnK like this.